The Molniya were Soviet communication satellites operating from an inclined highly elliptical earth orbit of 500 km × 40000 km with 12 hour period for coverage of high northern latitudes. 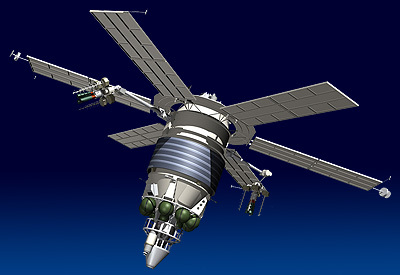 The Molniya satellites feature a unique configuration. The pressurized, three-axis stabilized KAUR-2 satellite bus features six non-articulated solar arrays and is operated in a sun-pointed mode. The antennas are mounted on two telescopic arms and are pointable. Each antenna features an optical tracking system which provides information to direct one of the two antennas to the Earth. The KAUR-2 bus features the KDU-414 propellant system with the S5.31 engine. From 1974 onwards, it was replaced with the KDU-414A with the S5.114 engine in 1974. It is derived from the propulsion system of the Venera 1VA probes. The Molniya-1 satellites carry the Alfa communications payload consisting of 5 transponders. It was used for bidirectional telephone, telegram or fax transmissions in the Orbita network or alternatively for TV broadcast. Three of transponders have a power of 40 W, and the other two of only 20 W. The first Molniya-1 satellites were equipped with two deployable parabolic antennas of 1.2 m diameter with a radiation pattern by 22°. After the transfer of the prime contractor for Molniya-1 from OKB-1 to the OKB-10, in 1965, the antenna gain was found to be two to three times lower than expected, so OKB-10 replaced each dishes antenna by four helical antennas. Several satellites, beginning with Molniya-1 3, carried an additional earth observation payload called Berkut consisting of two TV cameras, initially black and white, later also colour. This payload was used for meteorology and also for preparation of a early warning system. The Molniya-1 series was replaced by the improved Molniya-1K series.